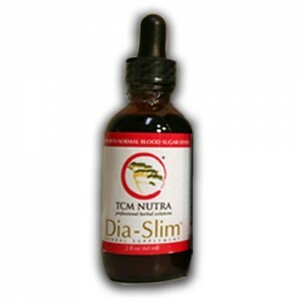 Dia-Slim™ is an organic herbal formula based on 10 years of research and is a powerful all-natural herbal remedy for weight loss, sugar and carb cravings, blood sugar issues and metabolic syndrome (Also called syndrome X). Each of the nine herbs was carefully chosen based on thousands of years of use in China and based on extensive modern research. All the herbs have been scrutinized by modern research methods and have no known side-effects. Dia-Slim is manufactured in the USA and is free of heavy metals, pesticides and adulterants. The herbs combine together to increase fat metabolism, support healthy blood glucose levels, short circuit sugar cravings and support the symptoms common to metabolic X syndrome*. 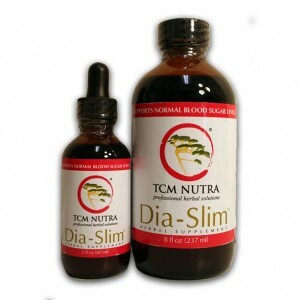 What is Dia-Slim™ used for? Indications for Dia-Slim™ include: unwanted fat, sugar cravings, high blood sugar (hyperglycemia), pre-diabetes, metabolic syndrome (a.k.a. syndrome X), high cholesterol, high triglycerides, hyperlipidemia, and high blood pressure*. Our formula is manufactured in the USA at an FDA (Food and Drug Administration) GMP (Good Manufacturing Practice) certified facility. Five of the herbs are certified organic. The entire finished product is analyzed in the lab to make sure it is free of heavy metals, pesticides or other contaminants. You can rest assured our formula is guaranteed to be potent, pure, effective, safe and easy to use. There are no known side effects for these herbs. Bitter Melon Fruit (Momordica Charantia) (Chinese name: Ku Gua): Helps balance blood sugar. One research study in Germany confirmed that a compound in bitter melon called Charantin, when extracted by alcohol, is more potent thatn the oral hypoglycemic drug Tolbutamide. Gymnema Leaf (Ayurvedic herb): Potent for balancing blood sugar. Has been used in clinical trials and has demonstrated effectiveness in both Type 1 and Type 2 diabetes. The herbs are combined together and decocted in water, which is how all traditional Chinese herbal formulas are created, allowing the herbs to attain synergy and pulling certain active constituents from the plants. Because water often does not extract valuable herbal compounds, the formula is also extracted using alcohol which pulls many more active ingredients and essential oils from the plants. Many herbal formulas manufactured in China are not alcohol extracted and they do no have many beneficial active constituents that only alcohol extraction provides. The end result? A potent and pure form of natural medicine manufactured using modern science that has been used safely for thousands of years. The 9 herbs in Dia-Slim synergize to create a powerful all natural herbal solution that promotes weight loss and may help prevent the onset of pre-diabetes, diabetes and metabolic syndrome. In terms of pharmacodynamics, Astragalus (Huang Qi), Atractylodes (Bai Zhu), Bitter melon (Ku Gua), Gymnema, Green tea (Lu cha), and Cinnamon (Rou gui) have all demonstrated hypoglycemic effects. However, it is Bitter Melon (Ku Gua) that has shown some of the best blood sugar lowering effects of any Chinese medicinal. To date, close to 100 in vivo studies have demonstrated the blood sugar-lowering effect of Bitter melon (Ku Gua). Many of Bitter Melon’s profound effects come from a substance called Charantin. In one comparative study, this herb performed better at lowering blood sugar than the hypoglycemic drug tolbutamide. This fruit has also shown the ability to enhance cellular uptake of glucose, promote insulin release, and potentiate the effect of insulin. In other in vivo studies, Bitter melon (Ku Gua) has been shown to reduce total cholesterol. Further trials have shown that Bitter melon (Ku Gua) can reduce adiposity (fat) and blood pressure. Hawthorn berry (Shan Zha) is also hypolipidemic, meaning that it too lowers blood lipid levels. It also improves the flow of the coronary arteries and lowers blood pressure. Recent research on nobiliten, a flavonoid found in Tangerine Peel (Chen Pi), has shown that the chemical is 10 times more powerful than naringen (found in grapefruit) for preventing obesity. Research on Tangerine peel and nobiliten also demonstrates powerful prevention of atherosclerosis and type II diabetes. Gymnema is called the “sugar destroyer” in India where it has been used for thousands of years. Modern research shows that Gymnema has a profound affect on blood glucose levels while improving insulin resistance. Spleen qi deficiency and slight yin deficiency with a possible phlegm damp constitution, possible stomach and intestinal heat, possible blood stasis, and possible food stagnation resulting in metabolic syndrome (a.k.a. syndrome X), diabetes mellitus, high cholesterol, high triglycerides, obesity, and high blood pressure. This formula is purposely formulated to cover a broad range of symptoms associated with metabolic syndrome. The formula can also be used for simple symptoms such as sugar cravings, weight loss or slightly elevated blood sugar. Metabolic syndrome is the combination of obesity, high cholesterol, insulin resistance, and high blood pressure. This syndrome is directly correlated to the incidence of life-threatening heart disease and stroke. According to modern herbal research, each of these herbs acts on one or more of the symptoms of metabolic syndrome. In terms of Chinese medical patterns, the patient can exhibit phlegm, dampness, and turbidity (i.e., the adipose tissue) plus stomach heat with some yin deficieny, spleen deficiency, a tendency to blood stagnation, and the possible complication of food stagnation. Therefore, within this formula, Astragalus (Huang Qi), and Atractylodes (Bai Zhu) tonify the spleen and enhance the qi while also benefiting fluids, move and transform phlegm and dampness, and supplement the middle burner. Tangerine Peel (Chen pi) aromatically penetrates and opens the middle burner and diffuses the upper burner, transforms phlegm and disperses damp. Hawthorn Berry (Shan Zha) transforms phlegm, balances the qi and disperses stagnation. Green tea ( Lu cha) harmonizes the stomach and clears heat, and dispels damp. Bitter melon (Ku Gua) clears heat from the stomach and intestines. Cinnamon (Rou Gui) gently guides heat back into the kidney, gently tonifies the Kidney yang and lower burner and transforms damp. Thus, this formula treats all three burners.